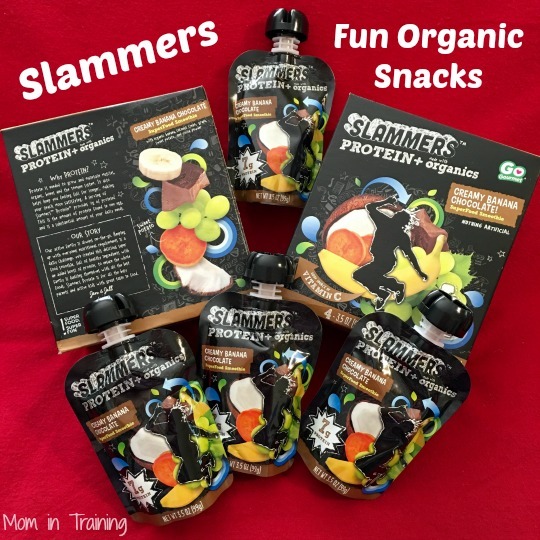 Stacy Tilton Reviews: Slammers - Fun Organic Snacks! Slammers - Fun Organic Snacks! I've shared about the awesome and unique snack called Slammers before and now I'm back to tell you about their latest flavor: Creamy Chocolate Banana. In our house the verdict is still out on if it's the kids new favorite or not. The kids just seem to keep going back and forth when I ask them. My son said it tasted like a shake, and my daughter said it tasted like a chocolate covered banana. I guess they good thing is they both are enjoying them and not even realizing that they are full of protein and superfoods. I love snacks like these that have hidden goodies for my kids! Plus who doesn't love a crumb and mess free snack that kids can enjoy both at home and on the go. Perfect for after-school lunches and sports, Slammers Super Food Snacks by Kids Gourmet just released a new protein Slammers Snack flavor for summer 2016: Creamy Banana Chocolate. Created to be delicious, easily digestible, and instant fuel for active kids, Creamy Chocolate Banana in addition to their full-line of flavors, is packed with protein and nutrients to keep kids energized, fueled, and focused. It’s creamy. It’s chocolaty. It’s banana-y. Flavor Combinations: Epic, Awesome, Chill'n, Pumped, Pomegranate Grape Crush, and Watermelon Kiwi Burst and the new Creamy Chocolate Banana.